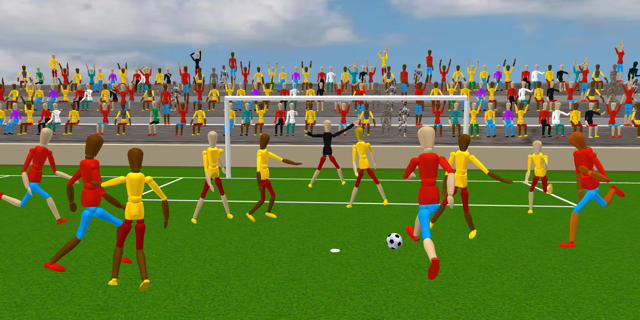 Here's a first beta version of Sweet Home 3D 6.0. The main reason to change the major version number is that the future macOS installer will probably come with its own copy of Oracle JRE 8, to avoid users to install Java under recent macOS versions. This will probably oblige to create a different version of the program for users still using Mac OS X 10.7 and older versions, but I won't abandon them. At the moment, this new version offers an updated catalog with a few special 3D models explained below. To simplify the communication about what people can legally do with the homes they design with Sweet Home 3D and also to renew a little the default catalog, I replaced the 24 models designed by contributors under LAL license and found among the 100 objects of the free version of Sweet Home 3D. Of course, these models are not lost and can still be found in the Contributors furniture library (they will be surrounded in green in the free models page until the final version 6.0 is released). - the picture surface of the Frame, the screen of the Laptop and the small frame in the Filled bookcase have texture coordinates to let you set the texture image you want. - the Frame contains a mirror surface under the picture surface with the material named flltgrey, and if you make flltgrey material invisible, you'll get a mirror at the two best rendering qualities. I hope you'll find this ability useful, and that after a while, you'll understand how rotation works. I prefer to let you test this feature first before improving it from your feedback. Note that this was programmed in such a way that it shouldn't be too hard to extend this feature to open doors and window sashes. Of course, more features will be added to Sweet Home 3D in the coming weeks (with furniture price management among other things). Be patient! It's a great announcement ! Can't wait for doing this! Honestly I'm not using SH since weeks (no time at all to play), but I have some models of doors duplicated to have closed/30/45/90/120/180 degrees of opening and having such feature would be great! If you have any insight on how to test it (how/what modify in the models) let me know. I'm a programmer and have sufficient skills in 3d modeling to modify my basic doors! Just a quick test. No problems, hiccups or slowdowns. Interesting development. Congratulations - and thanks. Yes, very useful. Especially to visualise the proportions of a room design. The mannequin will be put to work right away. No fancy figure needed for that. Modifying the mannequin is easy and consistent with rest of SH3D interface. 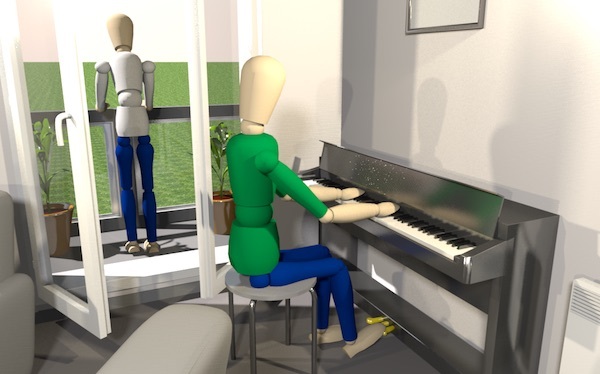 Very curious as to whether it could be possible to create my own 'deformation' models at some point, or indeed whether the mannequin will be (slightly) more human later. Tried to use a texture for the head without great success. Maybe the head could be mapped with a default texture that is easy to change as an easy way of adding just a touch more life. Another totally minor detail, it might be a bit easier to add colour (shirt / trousers / shoes) to a mannequin using military style colour names: (ArmUpperLeft,ArmForearmLeft,ArmWristLeft). Or maybe it does not matter at all. Anyway, the concept is great and looking forward to seeing where this will be going. You mention extend this feature to open doors and window sashes which sounds like a very good idea. Maybe even to other models as well. Yes, materials to manipulate a model has become very useful (especially after the invisible option). 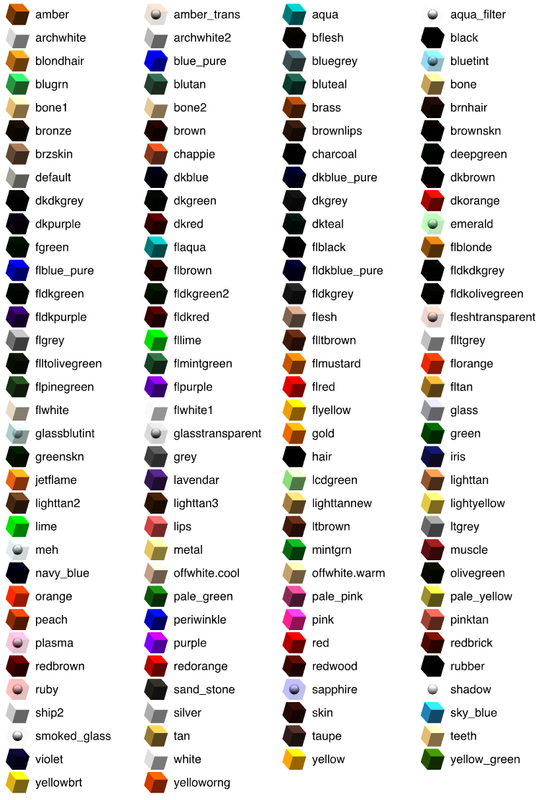 I would have preferred custom mtl materials like frame/mirror/canvas - easier to identify for SH3D users - but if I understood correctly, there are other reasons for using obj format colours (?). PS I get an error message for enkonyito's Rendering plugin (v1.5), but I guess that could have to do with using the Java Web Start version like several other plugins. Indeed, Java Web Start does not allow access to certain system properties hence this error message. Perfect for footballers and just in time for World Cup round of 16! Winner? Sweet Home 3D team, of course! Here's version 6.0 Beta 2 (I removed offline running and file associations to avoid conflicts with installed versions). 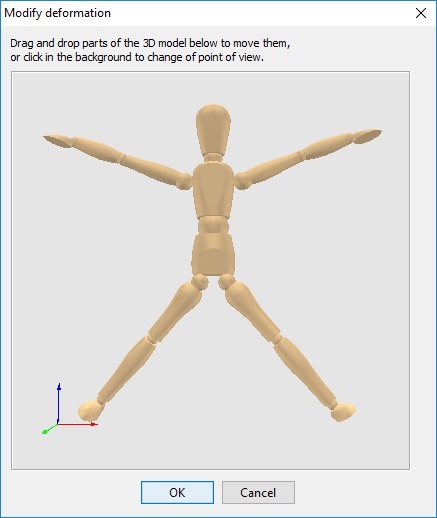 So, it's now possible to open windows, doors, cabinets and other objects when their modification pane displays a button named Modify openings or Modify posture for mannequins. This is now the case for 32 models in the updated default catalog. I added the default tag (défaut in French) to the 100 models of this catalog to let you find these models more quickly if you installed more libraries. When you click on the Modify openings button, a dialog box appears to let you rotate or slide some parts. I added a Reset shape button to reset openings or mannequin to their initial position (i.e. the one in their 3D model file) and three buttons to let you quickly change the point of view on the edited model. There's no limitations on the angles or translations, and you'll have to visually check if the 3D model will remain consistant or not. You can open sashes at a larger width than window's one and the drawing of the sashes in the plan will keep their size and location correctly. The selection rectangle in the plan will match the total width and depth of the 3D model like until now, even if this may lead to strange rectangles like in the following screenshot. As soon as an object is deformed, its size can be changed only proportionally, otherwise this could lead to strange shapes. If ever you need a wider or deeper or higher object, first reset its shape, change the dimensions you want, and deform again its shape. - Hinge parts are prefixed by sweethome3d_hinge_ followed by the order number of the hinge axis they describe, starting from 1 (for example, sweethome3d_hinge_1, sweethome3d_hinge_2,...). A given axis can be defined with more than one part, for example with 2 shapes named sweethome3d_hinge_1_top and sweethome3d_hinge_1_bottom. - The parts of an opening able to turn around the hinge numbered x should be prefixed by sweethome3d_opening_on_hinge_ followed by the same number x. 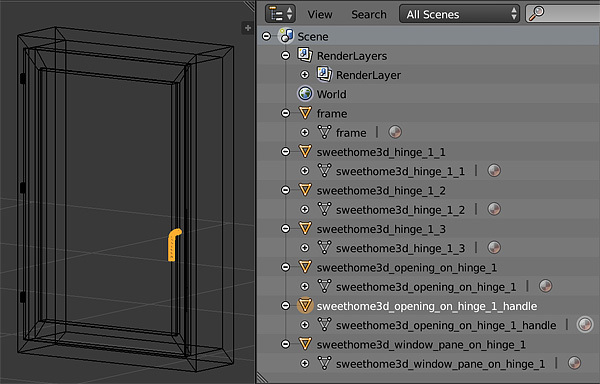 For example, sweethome3d_opening_on_hinge_1_door and sweethome3d_opening_on_hinge_1_handle will rotate around the axis defined by sweethome3d_hinge_1, or defined by sweethome3d_hinge_1_top and sweethome3d_hinge_1_bottom. 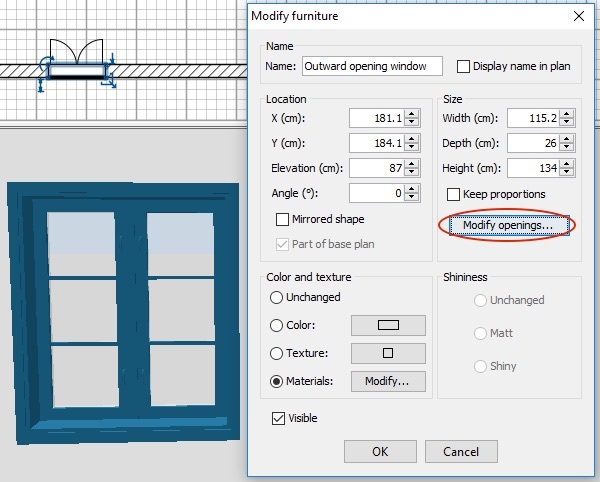 If you want to define transparent panes directly without a transparent material, you can also use the prefix sweethome3d_window_pane_on_hinge_ followed by the hinge number. The axis direction of the hinge x is guessed from the largest dimension of the global bounding box of the hinge parts. Thus, if the largest dimension of a hinge is its height, the axis will be vertical, if its largest dimension is its depth the axis will be horizontal in Y direction and if its largest dimension is its width the axis will be also horizontal but in X direction. Axes can only be parallel to X, Y or Z axes at the moment, but this looks largely enough. The axis may be defined with some dummy parts that are not visible (like in the kitchen cabinet). - Straight rail parts are prefixed by sweethome3d_rail_ followed by the order number of the rail axis they describe, starting from 1 (for example, sweethome3d_rail_1, sweethome3d_rail_2,...). A given axis can be defined with more than one part too. If a 3D model has multiple openings translating along a unique rail, you may also use the prefix sweethome3d_unique_rail instead. - The parts of an opening able to move along the rail numbered x should be prefixed by sweethome3d_opening_on_rail_ followed by the same number x. For example, sweethome3d_opening_on_rail_1_door and sweethome3d_opening_on_rail_1_handle will translate along the direction of the axis defined by sweethome3d_rail_1. If you want to define transparent panes directly without a transparent material, you can also use the prefix sweethome3d_window_pane_on_rail_ followed by the rail number. If a unique rail is used, you still have to number each opening to be able to distinguish the different openings that can be moved. Similarly to hinges, the axis direction of the rail x is guessed from the largest dimension of the global bounding box of the rail parts. Thus, if the largest dimension of a rail is its height, the axis will be vertical, if its largest dimension is its depth the axis will be horizontal in Y direction and if its largest dimension is its width the axis will be in X direction. Axes can only be parallel to X, Y or Z axes at the moment. 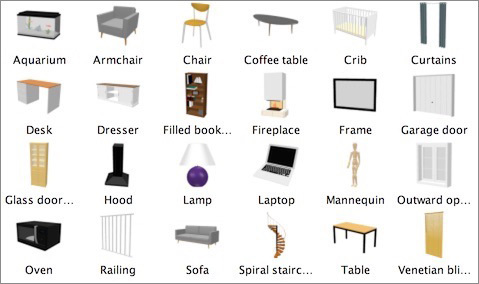 and all these prefixes must be found in a 3D model file, otherwise Sweet Home 3D won't accept to handle it as an articulated mannequin. 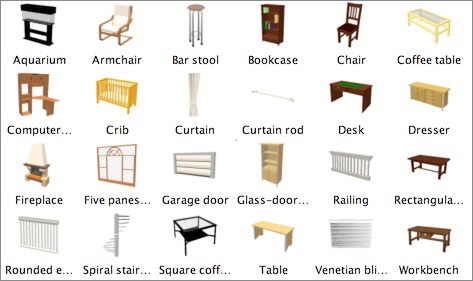 How to use these prefixes in your own 3D model files? In a file at OBJ format, it's quite easy because the parts of a 3D model are defined by lines starting by g or o, so you just have to look for these lines and add the good prefixes to make it work. If you want to visually identify these parts, you can import your 3D model in Blender, click and rename the different parts, and reexport them at OBJ format. Keep in mind to use the previous links to view some real examples using these prefixes. I'll try to update also 3D models found in other libraries. 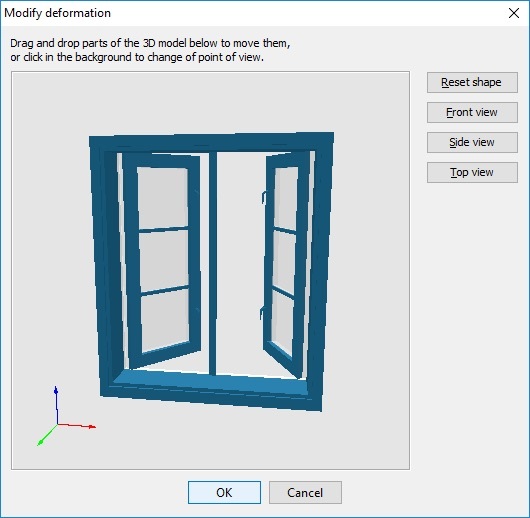 If you want to quickly test these features on existing homes, simply open the demos available in Sweet Home 3D, and play with the openings available in them. okh, I tried a few times to deform the head of the mannequin, but it gave only weird results. The problem is that if you start to give it a more human look, you probably have to change all the limbs and not only one part. Feel free to try yourself by moving vertices (or adding some) on the existing model in Blender, but it's a very time-consuming task. I'll try to define some texture coordinates on the head to check if it can give interesting results. About changing limb colors, I plan to improve the Material modification dialog box by allowing multiple selection in the materials list. Finally, I also changed the frame.obj file to use a separated MTL file with clear material names. This kind of object with a double use is already weird enough, not to make it more complicated for beginners! I tend to use predefined colors in the default catalog to simplify code organization, but sometimes I wonder if I shouldn't forget this old habit. Wow. This is exciting. Looking very much forward to experiment with a new set of windows. 2) I import window85x123.obj as a Door/Window, modify the opening, and then place it in the wall, the window is too deep for the wall. Anyway, congratulations. Very interesting development. Will test properly later.